With more than 300 existing dog breeds, you think that there would be a choice for every hound lover. From sighthounds and cattle dogs to companions and setters, the plethora of dog types is astonishing. But you know what's even more charming than the cutest, fluffiest Pomeranian? A big-hearted, fantastically colored mutt! 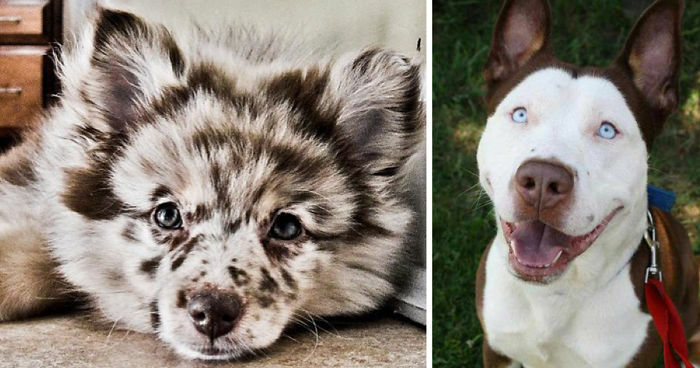 A crossbreed pooch might not enter official dog beauty pageants, but these dog breed mixes are not only charming but also healthier than their purebred counterparts. Buying a thoroughly bred dog guarantees the puppy's character, working qualities, and exceptional looks, but this kind of pedigree can also give some negative traits, such as various genetic disorders. Mixed breed dogs, in that sense, are much more resilient and show greater longevity. Now, we do not advocate careless dog breeding, with the shelters overfilled, but these doggies are more than adorable! Scroll down below for our picks of the dainty best mixed breed dogs and be prepared for an urge to get your own mutt! This is a beautiful dog. now it can breathe because it's nose isn't squished into its face - yay for outbreeding! He should have been named "Ken Kaneki"
Would you call that a Corgle or Bergi? Who the F are the 4 people (or single person with multiple accounts) shooting down our comments. What the hell is your issue?!? Wow. #21 Vihar Is Most Likely German Shepherd + Rough Collie + Sth. Rescued From The Streets Of Sofia. He is so short!! Hilarious and adorable. #37 Maltese/cavalier Puppy Vortex Of Cuteness! THOSE EARS! I'm totally smitten! #43 Jackson - My Pug Crossed With A Cavalier King Charles Spaniel - He Was Only A Pup! This is a gorgeous dog!!! Did this dog have braces? Perfect teeth! Can i give two points for this. He is so handsome. The dog is like " Are you taking a picture of me?" #60 Miko, My Border Collie Husky Mix..
His face looks like yin yang. Ooh, that's a great picture!! Love the expression, just perfect! #65 Meet Our Tinkerbell. She Is A Border Collie/lab Mix. To mix a large dog with a small one is cruel. #72 Webster - A Pit Bull Chocolate Lab Mix - 13 Years Young - The Best! Oh dear ... how do you resist those eyes?? #75 Winter - My Rescued Saluki Shepherd Mix Friend. What an absolutely beautiful dog!